Seasons – The Sun Shineth again! Let’s chat. 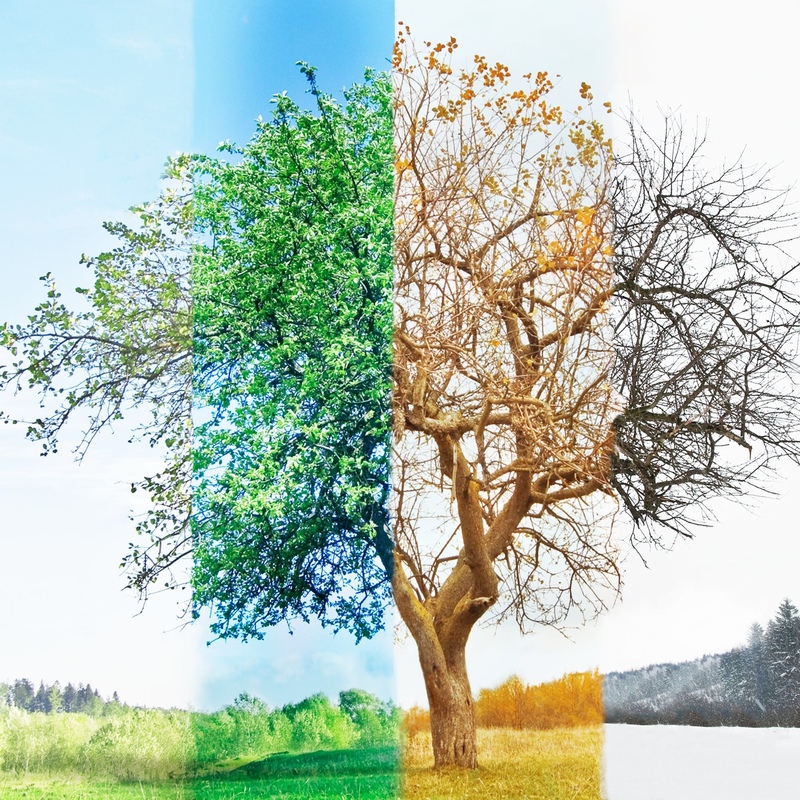 What’s your favourite season?! I love spring/summer and despise winter. As a matter of fact, I rather it be hot than cold. My friends and family thinks I’m crazy for that. Naturally, I am not a lazy person. But, the cold weather makes me really lazy. When it’s extremely cold, all I want to do is lay in bed ALL day with blankets. Who wants to be in bed all day? Not I. When it’s too cold, you have to layer up with jackets and sweater–& oh let’s not forget boots, hat, socks, gloves, and etc. Such heavy layering can bring discomfort. When it’s too cold, I can’t explore nature as I love and enjoy doing. Everywhere looks so gloomy and depressing. But, when the sun is out and the leaves are blossoming it makes me happy. Cold weather limits my outdoor experiences. Call me crazy, but I prefer it ‘hot’ than cold. I especially love it when there’s a cool breeze and the weather isn’t so hot or cold. Tell me, what’s your favourite season and why? My pleasure. If you look with hope towards change then you welcome it and not dislike it. Oh, I’ve never gone hiking in the fall. But today would be the perfect weather. Might give it a try when fall comes around. No 😆 but I took my students on a walk around the neighborhood. That should count, right? 😂😂 Absolutely! It was outdoors…so it counts! I’d like to put it into two categories. I like Fall & Spring because of the clothes you can wear and the beautiful colors outside. I like winter for the holidays and the snow looks like a blanket on the world. Makes everything look pretty. Summer, I’m undecided, because it gives everyone a reason to walk around “naked”, not something I want to see, LOL! But if I had to choose it would be fall, because I love having a reason to drink hot chocolate. Although, I’m sure others would say they drink hot chocolate all year round. Love this post! Haha! I could use some hot chocolates myself right about now. Like you I am all about spring and summer. I love observing the world come alive in the spring time and watching it grow through out the summer. Going barefoot and taking a dip in the pond to cool off are also among my favorite activities. Fall for me – I love the cooler temperatures that require sweatshirts. The leaves changing – it is so pretty. I must admit, the leaves going from green to orange during fall has its own way of beautifying the environment…make for a great scenery. We moved from the Central Valley of California 13 years ago … such a wonderful move! There, we had a long, hot summer (many days in the 100s with averages in the 90s) and a cold, foggy, dreary winter. Spring and autumn were too short. Now, in Montana, the winters are beautiful – just too long. Summer is mild and beautiful. Spring is gorgeous, but too short. I love the tulips before the deer eat the buds and blossoms. I love the daffodil and the wild flowers in the mountains. Autumn this year was spectacular. How can I choose one season? I can’t! Hahaha… I understand your struggle with picking one. Especially for one who have experienced it all in varying degrees. But I’m sure deep down within there’s one you relate most with…no? California is a place I have always wanted to visit. I always hear great compliments about the weather. The spring and fall are my favorite seasons because of the cool temperatures. But, I find beauty in each season. The winter is difficult at first because it’s so cold and sometimes we don’t have motivation to go outside. But, when I take myself out and walk in the snow, it feels so peaceful. So, each season has it’s gifts. Some require a little more effort to enjoy but its it’s all there for the taking. That really is the biggest challenge for me during winter: the lack of motivation to step out. Haha. Very hard to pick truly! Each season do have that “spark” that makes it unique. I could use some hot chocolate at the moment. Haha. Thanks for tempting me! I love spring because it’s not too cold like freezing or not to hot for sweating. I like the pleasant weather. But if there is hot ‘or’ cold, I’ll always prefer hot over cold..Same here.. Yes! Perfect explanation. You get me. Thanks for sharing.